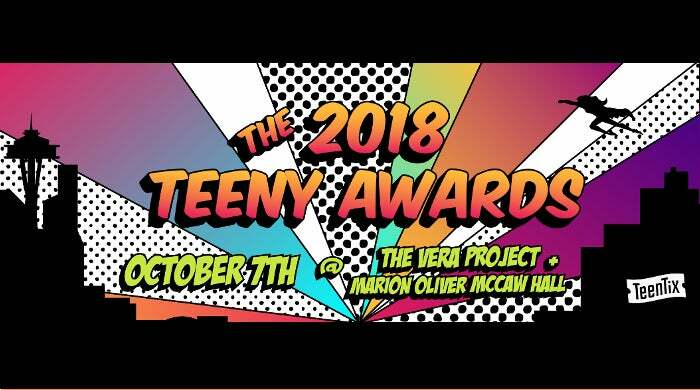 YOU are invited to join us at the 2018 TEENY AWARDS (aka Seattle's Biggest Little Awards Show) on October 7th at THE VERA PROJECT + Marion Oliver MCCAW HALL! It's a celebration of all that is artsy, important, and awesome in the PNW, and the MOST fun way to recognize the amazing things our 75 TeenTix Arts Partners do best. TeenTix is inspired by the teen superheroes of the world--so many powerful young voices to applaud! So of course, we invite you to don YOUR fanciest superhero attire and join our party: complete with cupcakes, swag bags, surprise performances, and so. much. more. AND, this year, tickets to the awards ceremony are FREE! After the ceremony, join other incredible human beings who believe in #ArtForAll at the Teeny Awards Dinner--it's your best chance all year to support TeenTix and its mission to keep art affordable and accessible for all youth!